TASK: Add technological distinctiveness to collective. ENGINEER May "steal" unattended Equipment cards present. May download any one Equipment card in place of one card draw. 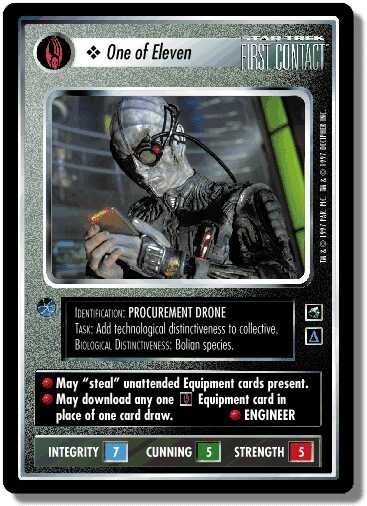 This drone may steal any equipment card for the Borg to use, regardless of that equipment’s affiliation restrictions. However, the Borg never use hand weapons. See stealing. There are 23 entries for One of Eleven (ST1E 4 C 84) at the Tradeplace (91 haves and 0 wants). Click here to see all trade list entries for this Common card!